Delightfully fresh and gloriously bright, the stunning JAZZ is just the ticket for an exceptional St. Thomas motor yacht charter vacation this winter. 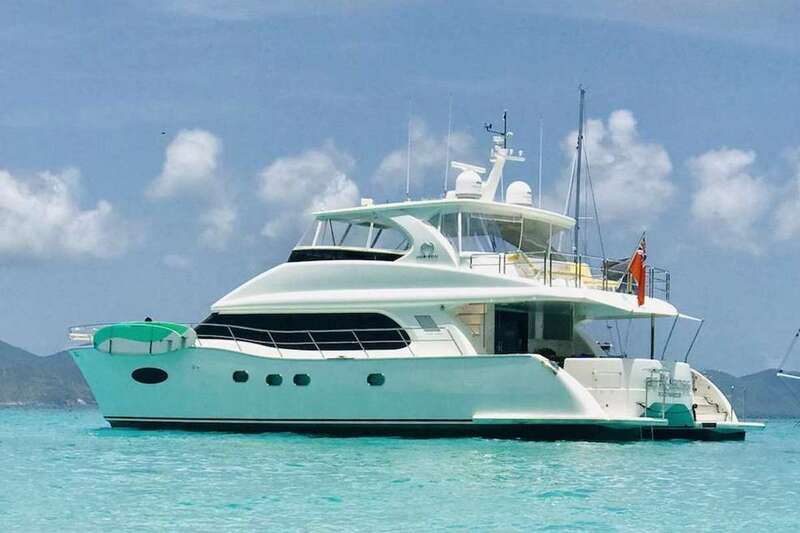 Ideally designed to soak up the idyllic year-round climate and spacious enough to accommodate 8 guests in stunning luxury, this recently jazzed-up Benetti is ideal for a group of four couples. 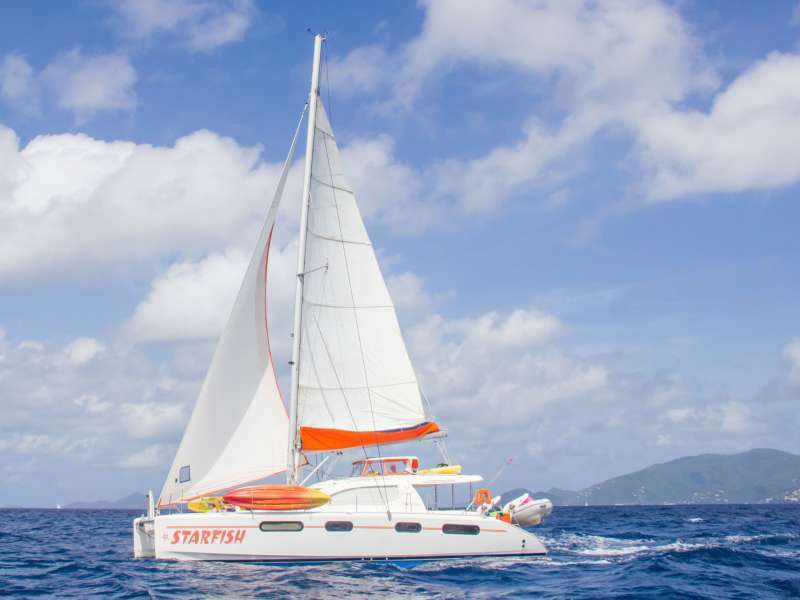 Or a family charter looking for loads of fun, unequivocal comfort, gastronomic indulgences and an attentive and professional crew. The adaptable accommodation means you can bring everyone along – from kids to grandparents – and know everyone will enjoy their privacy and home-style comforts. 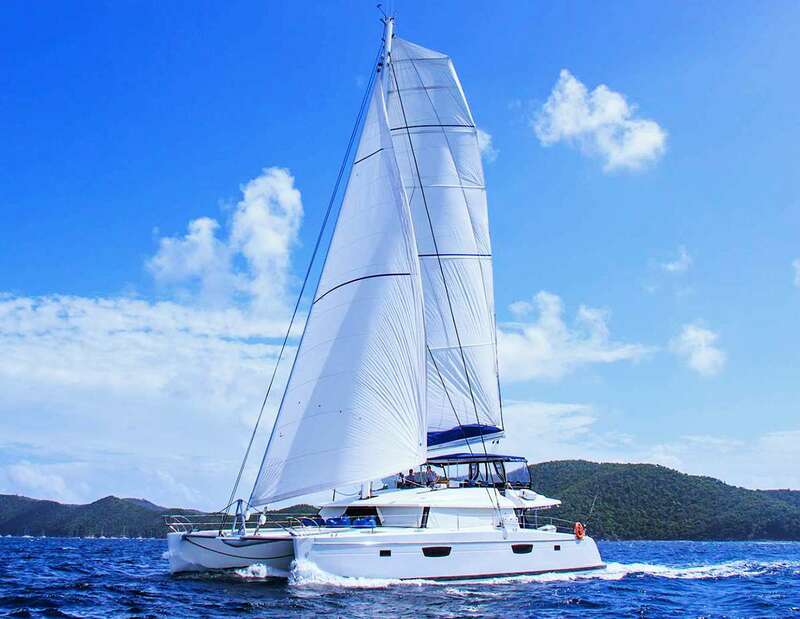 With a successful charter record on her sails, JAZZ is a confident choice for those who are after an uncompromising charter in the US Virgin Islands. A modern classic with infinite style and class, not to mention a 6-strong crew who’s old hat at the charter game – and you’ve got yourself a truly unforgettable charter adventure. 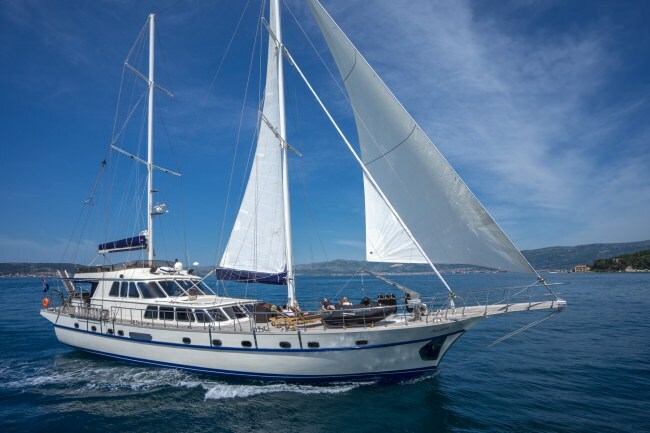 Zero-speed stabilizers make JAZZ a very comfortable yacht both underway and at anchor. Her very spacious lounge areas make her seem much larger than her size and offer both indoor and outdoor corners to relax, sit back and socialize with loved ones. The al fresco dining and bar on bridge deck is everyone’s favorite spot along with the sumptuous L-shaped lounging area with plush cushions that you’ll find impossible to leave. When you do manage to tear yourself away, you’ll have a 30-foot speedy tender to get to shore or to do some serious fishing. 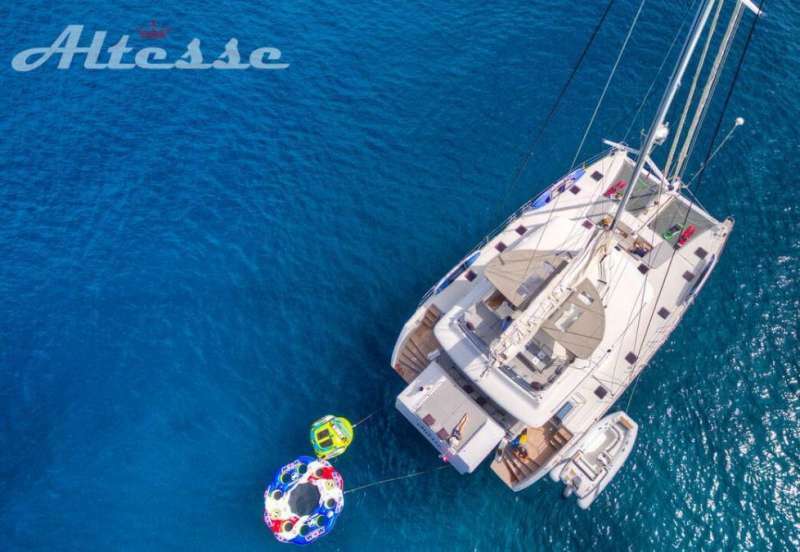 If you love nothing more than a little frolic in stunning waters, then JAZZ offers you plenty of opportunities for fun in the sun. Onboard, you’ll find excellent fishing gear, a 3-person waverunner, water skis, 2 sea bobs, 4 stand up paddle boards, a wakeboard and plenty of snorkel gear to discover the Virgins underwater treasures. Plus a host of inflatable toys that offer fun for every guest, no matter their fitness or age. Ever found your dream St Thomas motor yacht charter and then discovered that the cabin configuration simply won’t suit your traveling tribe? Not with JAZZ, a smartly designed motor yacht that allows for maximum cabin flexibility. A total of 4 beautiful cabins accommodate up to 8 guests, with 1 King-bed Master Suite, a VIP King-bed Stateroom and 2 Guest Stateroom whose beds can convert from TWIN to QUEEN in no time at all. Each cabin has its own private ensuite, of course, as well as plenty of storage and chillout space. The elegant décor of dark mahogany and plush linens make JAZZ an absolute delight, by day and night. A recent guest gushed that JAZZ was a ’10 out of 10’ before even considering the crew. And then, it just went ‘off the charts’. This is the kind of feedback we absolutely love because it simply confirms what we know: the crew of any yacht charter is what will make or break any journey and when it comes to JAZZ, the enjoyment of your St Thomas motor yacht charter is guaranteed. It is worth noting that many yachts in this size range only have four crew so with Jazz, you are getting extra service and extra smiles every day. You can all be enjoying different activities while ensuring that you will always have the assistance of a crew member nearby. The JAZZ “family” combines the skills and experience of six delightful individuals, each one bringing something unique to the mix. Captain Lee Fraser is at the head of the helm and this salty dog who hails from New Zealand has been in boats since he was barely able to walk. His extensive experience and qualification – with a range of yachts and destinations the world over – make him a prime example of everything a Captain should be. Fun and outgoing but also professional and competent, he’s the kind of guy you want up front. Not to be outdone, the rest of the crew boasts equally impressive pedigrees. European-raised Chef Matthew is the master of the galley and he brings his extensive 5-star resort experiences onboard JAZZ. He has won numerous awards over the years and has been widely recognized as one of the leading culinary geniuses in the charter market. For foodie value alone, not to mention all the other stellar attributes, a JAZZ St Thomas motor yacht charter experience is worth its weight in priceless jewels. St. Thomas’ ease of access from the US is one of the things that attracts yacht charter guests there. But more than that, it’s the calm seas, idyllic anchorages, pristine beaches, short cruising distances, casual nightlife and charming little harbors – all set in a tropical wonderland – that make this one of the world’s top yacht charter destinations. 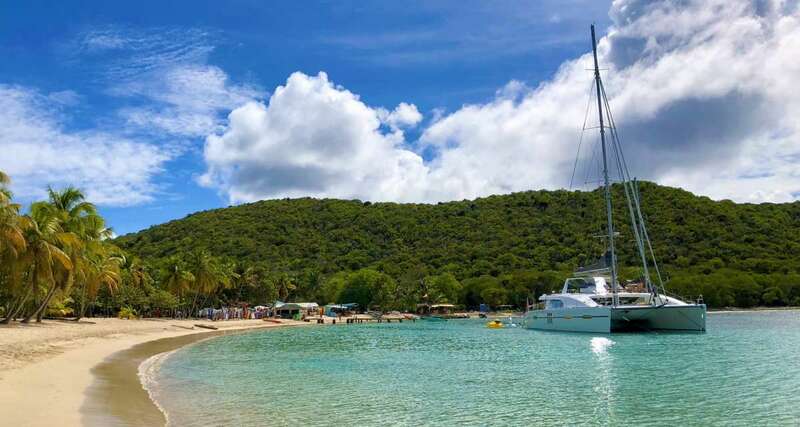 St. Thomas’ premier marina, Yacht Haven Grande, is only minutes from the airport , and is the ideal place to start your St. Thomas motor yacht charter vacation. 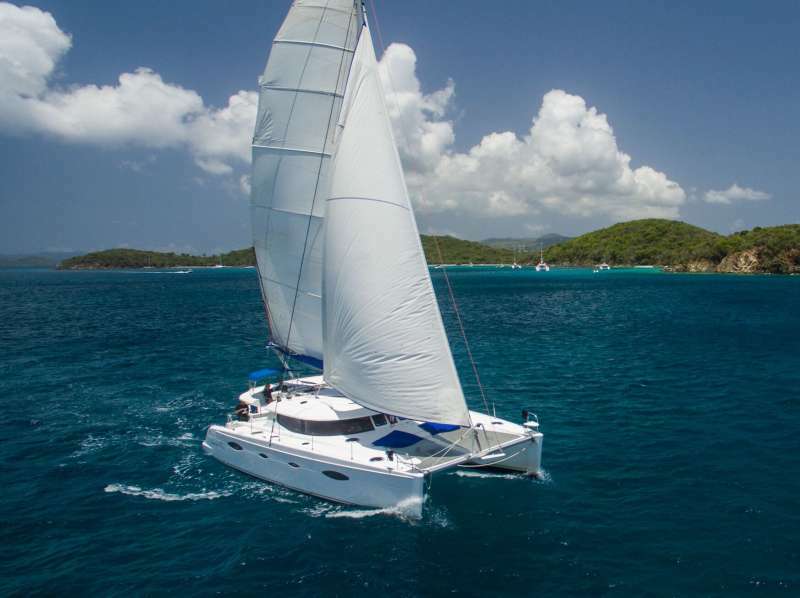 St. Thomas is the stepping stone to St. John and the BVI on an itinerary that the Captain customizes to your tastes. You might spend a little time at the end of your trip to take in some duty free shopping, but you will spend 90% of your time in the BVI. You can also JAZZ it up in New England this summer and the Bahamas in the late Spring months.